Recommendations and endorsements I have recieved from managers, reports and colleagues. "Svein-Magnus is a thorough and efficient guy. He figures out things quickly, and does not need a lot of input to do a good job. He has a intuit understanding of what is important, and what can be left for later. In my position at the same level as Svein-Magnus, we often made use of each others work and insight, I valued the work he did, and will continue to use the templates and procedures he created." "I had the pleasure of working with Svein-Magnus as his Team Manager, and if I were to describe him with only one word, that word would be "accurate". His precision pervades all his work, thus his productions hold very high standards. He also distinguishes himself with vast knowledge about many fields, even outside of IT. Svein-Magnus represent a tremendous resource for almost any IT-enterprise." "Svein-Magnus worked at Itera Consulting during three years that were full of changes. During these years Svein-Magnus contributed actively to redefining the focus of the company and to realizing Iteraâ€™s new strategy. He also delivered very good projects for many different clients. His skills, optimistic personality and his good sense of humor made him very popular among his peers. We will miss him and hope that we will meet again in the future." "Svein-Magnus er en hyggelig og lÃ¸sningsorientert person. Han finner fort gode lÃ¸sninger pÃ¥ problemer med et smil om munnen." Svein-Magnus er ogsÃ¥ en trivelig og omgjengelig person med allsidige interesser og engasjement deriblant Open Source, Ã¥pne data og sjokoladesmaking. Han er meget kunnskapsrik pÃ¥ mange omrÃ¥der, sÃ¥ om man har gleden av Ã¥ jobbe med Svein-Magnus vil man aldri gÃ¥ tom for diskusjonstemaer i lunchpausene." "Svein-Magnus is a very knowledgeable person who's able to get a quick overview of the problem domain and is up to speed in little or no time. His work span covers knowledge with technology and system implementation to conceptual models and business models. He is social, open and easy to work with as a person." 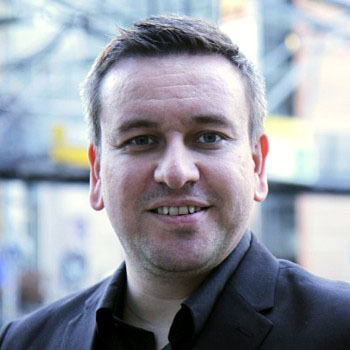 "Svein-Magnus is a passionate speaker and promoter of the Open Data movement in Norway. As founder and promoter of Oslo Open Data Forum he has been a key catalyst for Open Data both in the government and in the public sector." "It's never boring being in Svein-Magnus' company. He shows a lot of energy and is very dedicated." og han tilfÃ¸rer sterk kompetanse, kundeinnsikt og god stemning." "Focused, to the point developer while still keeping the big picture of the job to do!" "I had the pleasure of working with Svein Magnus while establishing project methods and tools for the City of Oslo. Svein Magnus carried out every requirement concerning the new tool, developed in Confluence, with the highest professionalism and quality. He is very easy to work with, always with a smile and willingness to do the little extra to achieve the best possible result"
"I met Svein-Magnus while attending GrÃ¼nderskolens San Francisco programme. We worked together on our business project, and in the end presented it to a team of venture capitalists. Svein-Magnus is very knowledgeable and a resource for any team. He provides good, constructive feedback and is very solution oriented." "I worked with Svein-Magnus in a group establishing Computas policy as employee share ownership. Svein Magnus is a dedicated and active professional adding great value to the work of the group." "Jeg kjenner Svein-Magnus som en engasjert medarbeider med mange gode ideer og kreative innspill. Han er veldig omgjengelig og veldig synlig i organisasjonen." "Svein-Magnus was a member of my portal and collaboration discipline group at Computas, where I was the discipline advisor. Svein-Magnus is very professional, creative and conscientious. It is easy to recommend him for other projects and companies, and I hope to be able to use his skills and knowledge in a future project." "Svein-Magnus is an enthusiastic and creative person with the ability to inspire his peers through discussion and through his deep level of involvement in cooperation. I've enjoyed working with him and have had many interesting discussions with him. Svein-Magnus takes great interest in a wide range of areas and people." "Svein-Magnus er en positiv, imÃ¸tekommende, engasjert, kunnskapsrik og dyktig kollega. Han gir raske tilbakemeldinger, har veloverveide og gode innspill, er sosial, omgjengelig og skaper god atmosfÃ¦re i sine omgivelser." "Svein-Magnus is a hard-working, well-structured individual who is excellent at taking charge and leadership. He is very knowledgeable and also has the ability to awaken inspiration in others." "I really enjoyed working with Svein-Magnus at Searchforce. He is a very enthusiastic software engineer with good knowledge on Systems and Security." "Svein is a great coworker and nice person to have to go through your long days at work. Helpful, dedicated and smart." "I was on the Start NTNU executive board with Svein-Magnus and he is an ambitious, intelligent and honest person. When highly motivated, he can accomplish great tasks! He shows interests in several fields, and has developed technical skills, as well as inter-personal skills. Prior to his contribution on the executive board, he did a great job developing the internal and external webpages of Start." "Svein Magnus was the head of the Web Development team at Start NTNU where I was employed. He is an easygoing person with excellent teamleader abilities. He is also a very skilled developer which I learned a lot from." "Svein-Magnus was an important member of the ISFiT IT group, with excellent technical skills. He is a very sociable guy, and was a positive contributor to the work environment."